Cape Cod whale watching is truly spectacular. Seeing these gigantic mammals gracefully swimming alongside a whale watch boat is for many, the most memorable event of their holiday. It is amazing how these large creatures can be so docile and careful as they swim near the boats. Whale watching tours depart regularly from Plymouth, Barnstable and Provincetown Harbors and many even guarantee a sighting. The Cape Cod whale watch tours all head to Stellwagen Bank National Marine Sanctuary, the whales' favourite feeding grounds. 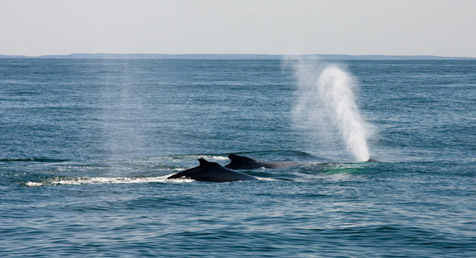 Each year, beginning in late winter, whales return to Stellwagen which encompasses over 600 square nautical miles, about 26 miles east of Boston, 6 miles north of Race Point and 7 miles from Gloucester. Because the water is shallow here, the whales are able to feed on the nutrient rich plankton which rises to the surface. During your excursion, naturalists will help you spot, identify and learn more about these massive creatures. You are likely to see humpback, finback and minke whales, and it is truly an eye opening experience. You might even see whales breaching (leaping straight out of the water into the air). Sometimes, a whale will even slap the water with its flippers as if acknowledging the spectators. The boats are very careful not to get too close to the whales, to avoid disturbing their natural habits and activities. The whales however, have grown accustomed to the presence of these whale watching boats and frequently swim underneath them---making for a scary experience. Whenever a whale begins a deep dive, it raises its tail fin high out of the water in preparation for a long dive to the bottom. 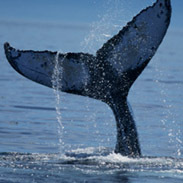 During this time, many of the naturalists on-board the whale watch vessels, photograph the unique tail markings for identification later on. This allows them to keep tabs on the movements and life cycles of the different whales and provides a wealth of valuable knowledge to aid conservation efforts. 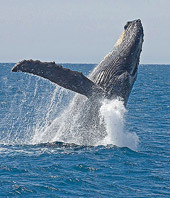 Every season, the naturalists identify several hundred different whales on their tours. The markings are sort of like whale fingerprints. 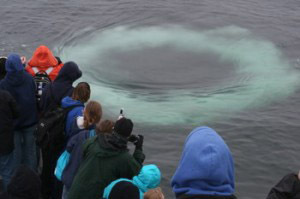 One of the the neatest things I saw on my Cape Cod whale watching expeditions, were whale bubble rings. Humpback whales use this method to hunt food by rounding up concentrated masses of prey. The hunting members of a pod form a circle 10-100 feet across and about 50 feet under the water. 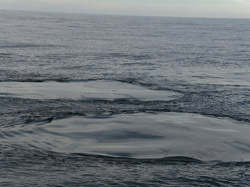 Then the whales blow a wall of bubbles as they swim to the surface in a spiral path. The wall of bubbles makes the trapped fish move to the surface of the water in a giant mass. Single whales also have been seen doing this and people think it is a way for them to socialize with us. Another circular pattern you will see on your Cape Cod whale watch expedition, is called a footprint. Sometimes when a whale is moving under water, the energy from the tail movement produces a slick spot on the surface of the water. These slick spots are called “whale footprints”. The sheer size of them are massive you can almost feel the power that produces them. If you go out on a Cape Cod whale watching charter, we suggest that you bring: warm clothes, rubber-soled shoes, binoculars, a camera and/or video camera, and, if possible, rain gear. While most boats do not serve food on-board, you are welcome to bring your own snacks. A word to the wise---bring Gravol or Drammamine in case the seas are rough. You can also plan a sunset whale watching cruise which is really nice. The seas are usually calmer at that time too so if you have a weak stomach that might be your best bet.